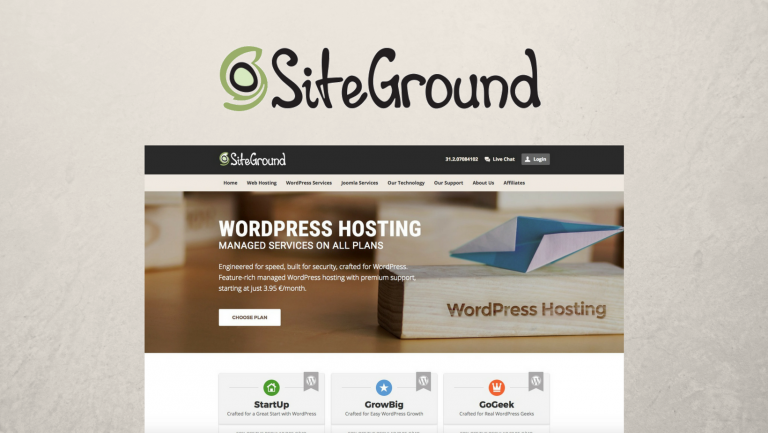 Today we are looking at a web hosting company named A2 Hosting, a larger company started all the way back in 2001 as a one-person side project and has since grown to over 40 employees with datacenters in 3 locations around the world. Last year I interviewed Brad Litwin, their marketing manager about the company and behind the scenes so check it out if you’re interested to hear more about them. 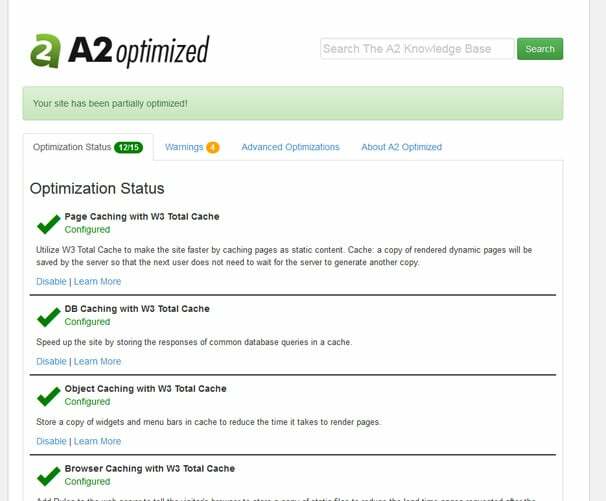 A2hosting have since started to tailor their service more for WordPress users with some custom features and their own free optimization plugin named A2 Optmized WP so I thought I would take a look at the service on offer and run some tests to see how the service stacks up. All A2hosting plans are hosted on their exclusive “SwiftServer Platform” which are their own optimized servers which are powered by APC/OPcache, Turbo Cache & Memcached, all their servers also use Solid State Drives (SSD) which greatly speed up access time of the drives. 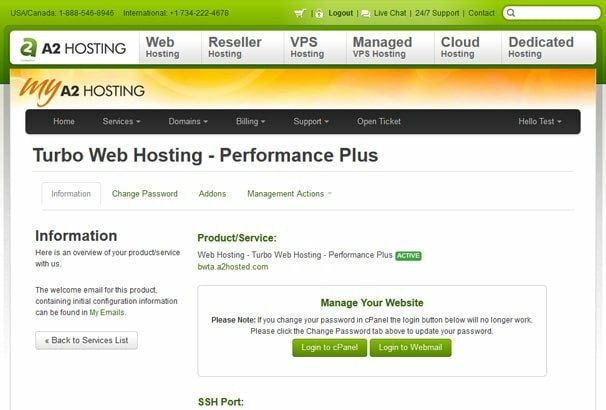 When you login to your account at A2 Hosting, you are provided with a page which contains login links for cPanel and your webmail. This is a useful page as it also lists everything you need to know about your account – FTP details, chosen plan, billing details and so on. Logging into cPanel you will see they provide a customized version of this popular management system. 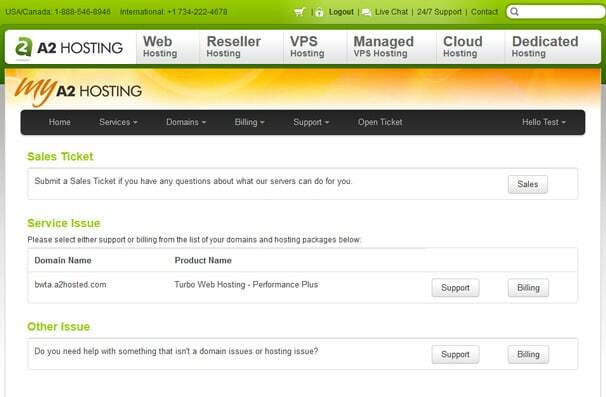 cPanel is my favourite hosting panel, its really simple to use but contains loads of different features – everything you need to manage your website. 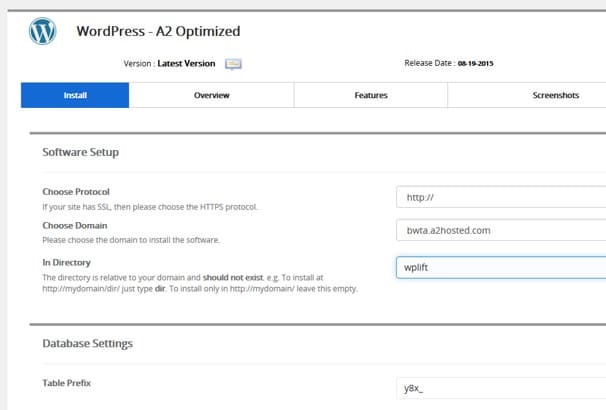 There is a section named “Softaculous Apps Installer” which contains a number of scripts you can install with one click, here you will find “WordPress A2 Optimized” which you can use to install WordPress. Clicking the “Install” link then lets you choose the options for your installation, the system chooses a unique username and complex password for you and you can choose the directory / domain etc for the installation. Clicking install will bring up a progress bar which shows how long the install process is taking. Once the installation has finished, you will be emailed the login details for your new WordPress site, the A2 system generates a unique admin login URL so it wont be “domain.com/wp-admin” but something like “domain.com/syweh” this is a nice extra layer of protection from hackers so they wont be able to brute force your login page without knowing it’s location. When you first go to login, you will see it has also added a reCaptcha box as well for even more protection. After you login to your new WordPress site, you will see some pre-configured plugins added: Clef ( for logging in with your phone), EWWW Image Optimizer, Jetpack, W3Total Cache and Rename Login.php. 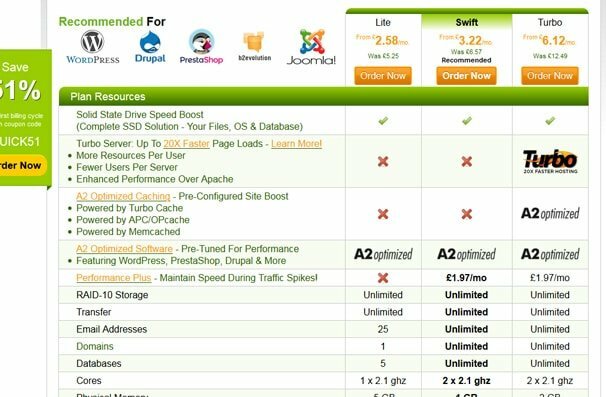 The one of interest is called “A2 Optimized” which is a free plugin you can download here created by A2 Hosting for speeding up their client’s WordPress sites, although its free to use for anyone, if you use it with A2 hosting you get some additional features. Page Caching with W3 Total Cache – Page Caching stores full copies of pages on the disk so that PHP code and database queries can be skipped by the web server. DB Caching with W3 Total Cache – Database cache stores copies of common database queries on disk or in memory to speed up page rendering. Object Caching with W3 Total Cache – Object Caching stores commonly used elements such as menus, widgets and forms on disk or in memory to speed up page rendering. Browser Caching with W3 Total Cache – Add Rules to the web server to tell the visitor’s browser to store a copy of static files to reduce the load time for pages requested after the first page is loaded. Minify HTML Pages – Auto Configure W3 Total Cache to remove excess white space and comments from HTML pages to compress their size. Minify CSS Files – Auto Configure W3 Total Cache to condense CSS files. Gzip Compression Enabled – Turns on gzip compression using W3 Total Cache. Deny Direct Access to Configuration Files and Comment Form – Enables WordPress hardening rules in .htaccess to prevent browser access to certain files. Lock Editing of Plugins and Themes from the WP Admin – Turns off the file editor in the wp-admin. reCAPTCHA on comments and login – Provides google reCAPTCHA on both the Login form and comments. 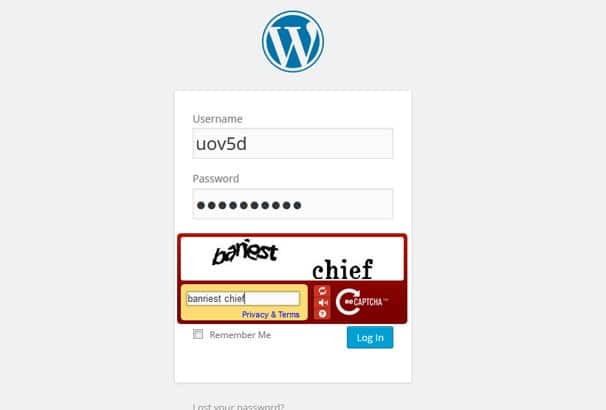 Prevents bots from automatically brute-force attacking wp-login.php Prevents bots from automatically spamming comments. Compress Images on Upload – Enables and configures EWWW Image Optimizer. Compresses images that are uploaded to save bandwidth. Improves page load times: especially on sites with many images. 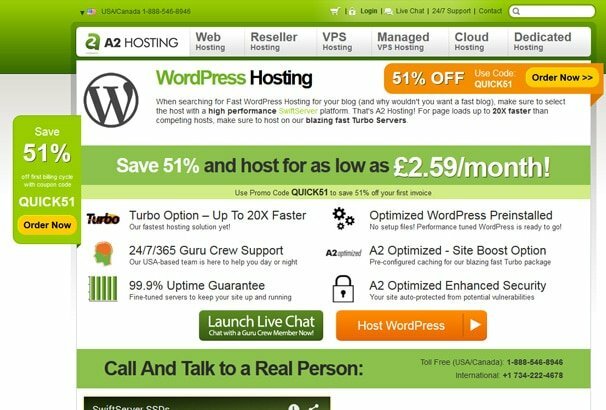 Turbo Web Hosting – Take advantage of A2 Hosting’s Turbo Web Hosting platform. Faster serving of static files. I tested my demo site with and without the optimization plugins activated. On a fresh installation of WordPress with the default Twenty Fifteen theme, the site loaded in 800ms which is quite respectable. With the A2 plugin and W3 total cache activated however, site load times were halved to just over 400ms. 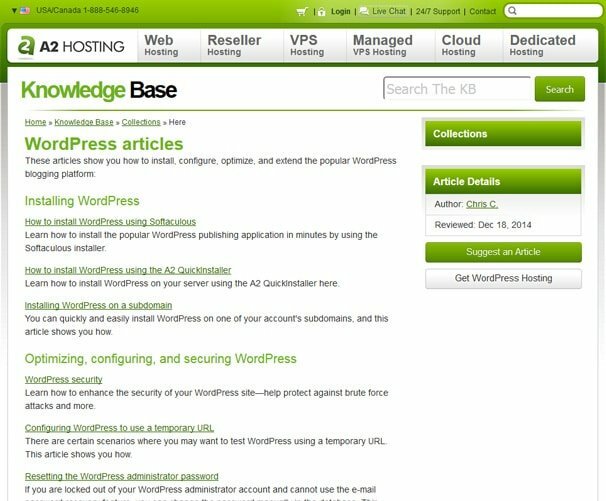 There is also an extensive Knowledge base section which contains lots of very detailed tutorials for just about every aspect of their hosting, including a comprehensive section about WordPress. I did not personally submit any tickets myself during this review so I can comment personally about it but I did look around online for testimonials and found they have a very good satisfaction rating with a 4.7 score out of 5, which was based on over 800 reviews so that seems very positive to me. 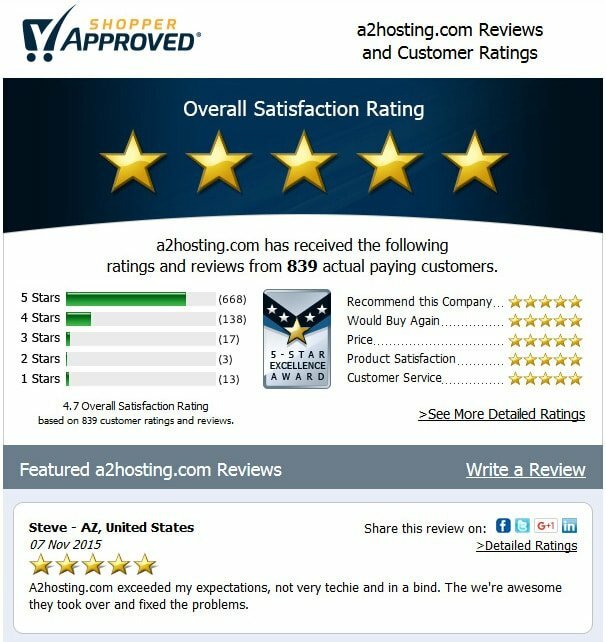 A2 hosting felt very solid to use for me – they are a long established traditional hosting company so it’s reassuring to know they have been in business for so many years and they obviously have a very good infrastructure in place. 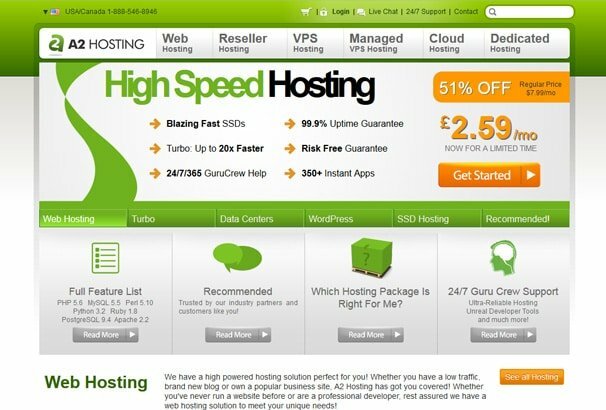 Their pricing and service levels puts them in competition with other shared hosting companies such as HostGator, Godaddy and so on. I would definitely recommend them over those companies, I have also tested those a lot via client’s who use them and I find them of poor quality in general with slow loading times, timeouts in the WordPress admin area due to low PHP resources and so on. 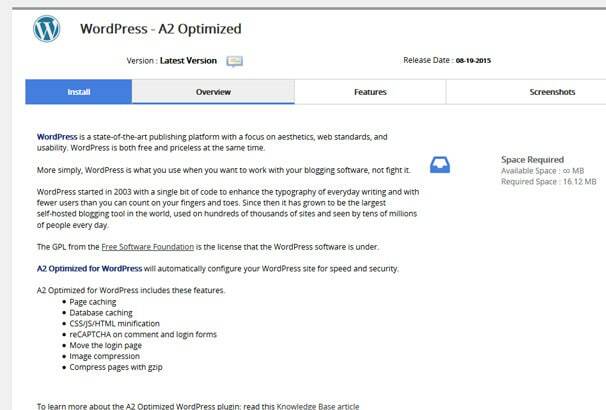 A2 have made a good start trying to cater towards WordPress users as you can see from the specific features they offer, they have taken in mind the weak points of WordPress such as security and site speed an put together an offering which addresses these for beginners. I see their WordPress hosting offering aimed more towards beginners who wouldn’t be able to configure a plugin like W3 total cache theirselves or put in place the security measures needed to secure their site properly.